Build a Django content management system, blog, and social networking site with James Bennett as he introduces version 1.1 of the popular Django framework. You’ll work through the development of each project, implementing and running the applications while learning new features along the way. Web frameworks are playing a major role in the creation of today’s most compelling web applications, because they automate many of the tedious tasks, allowing developers to instead focus on providing users with creative and powerful features. Python developers have been particularly fortunate in this area, having been able to take advantage of Django, a very popular open-source web framework whose stated goal is to "make it easier to build better web applications more quickly with less code." 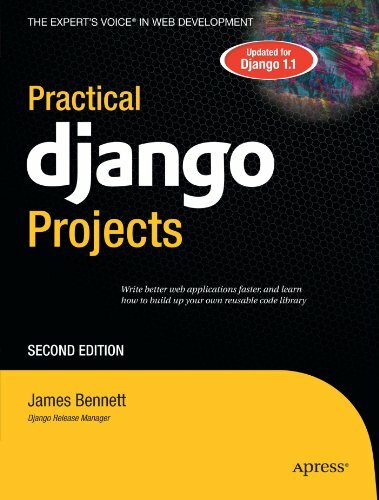 Practical Django Projects introduces this popular framework by way of a series of real–world projects. Readers follow along with the development of each project, implementing and running each application while learning new features along the way. This edition is updated for Django 1.1 and includes an all-new chapter covering practical development tools and techniques you'll be able to apply to your own development workflow.